The OLFA Quilt Cruise for 2 Sweepstakes is open only to legal residents of one of the fifty (50) United States (including the District of Columbia) who are at least twenty-one (21) years old. 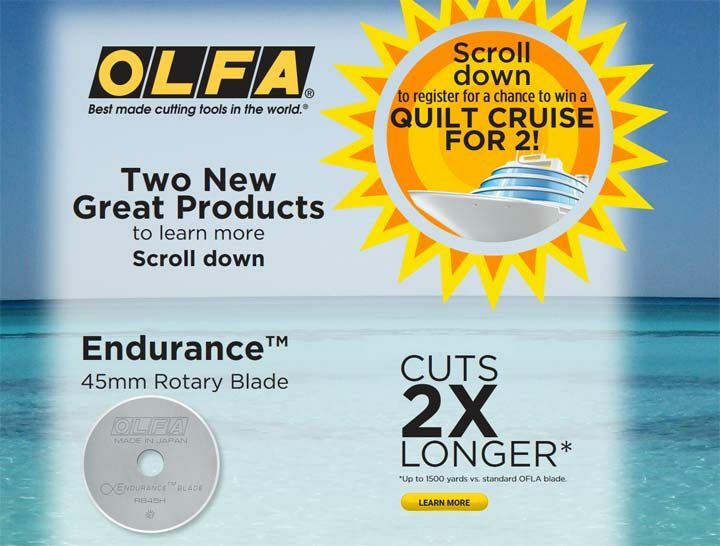 The OLFA Quilt Cruise for 2 Sweepstakes ends on July 15 at 11:59:59 PM CT.
An eligible entrant may visit olfa.com/quiltcruise and complete and submit the registration form. Prize (1): The prize is a seven (7) day Eastern Caribbean Cruise for two (2) from OLFA and Quilt Seminars At Sea – November 25 – December 2, aboard Holland America Line ms Nieuw Amsterdam leaving from Fort Lauderdale, FL. Trip will include; Double Room, Verandah Outside Balcony cabin for 2; round trip coach class airfare between the major commercial airport closest to winner’s residence and Fort Lauderdale, Florida; Planned stops in Amber Cove, Dominican Republic; San Juan, Puerto Rico; St. Thomas, US Virgin Islands; Half Moon Cay, Bahamas (TR) in addition to two quilting fun-packed days at sea; Meals, services, activities and entertainment on board; Quilting classes and Round Robin Sampler; Souvenir tote bag; “Sewical” activities and parties onboard, including: Welcome Aboard party, Challenge block contest, “Sew & Tell” at the farewell party; Kit fees/materials cost, and a $400 check made payable in the winner’s name that can be used to help cover transfer to and from port. ARV: The ARV of the prize is $6,640.